DKM specializes in manufacturing performance orientated clutch kits and flywheels for European vehicle applications. 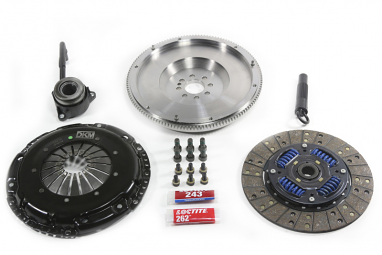 Our product offering consists of street performance clutch kits to complete racing applications. Through our continued product development, testing and manufacturing processes we are able to offer a quality product at a competitive value to our customer. USP Motorsports is a leader in auto parts for Volkswagen, BMW, Audi & Porsche. As such leader, our shop techs strongly favor the DKM brand for a wide range of European applications. Seen as an OEM+ brand of clutches, DKM clutch and flywheel kits are an easy choice for our customers. The MB Clutch Kit assembly provides up to 80% increase in torque capacity and is ideally suited for aggressive street use and moderate track use. The composition of woven brass and organic material with alloy backings provides smooth engagements and extended life. Each kit is comprised of a pressure plate sprung organic disc and steel flywheel. Additional parts such as pilot bearing/busing, throw-out bearing (are included if applicable) and alignment tool are also included.